We will be releasing the teachers and workshops for Yarnporium starting 15 May, so keep you eyes on the blog and Yarnporium page for more details and ticket info. The Great London Yarn Crawl is happening again this year! Save the date for 1 July when tickets go on sale – routes will go up a couple of weeks earlier. Allison's Impressionists MKAL finish in Madelinetosh from deep stash. Allison finished her Impressionist MKAL from Helen Stewart, knit from Madeleinetosh from the deep layers of stash. When the picot bind off became too much, she cast on for the Mon Manet by Jonna Hietala, in La Bien Aimee Merino Aran in Grellow. Progress on Mon Manet! Just the waistband and sleeves to go! Rachel finished the first sleeve of Marginalia in the post-heat wave rainy miserable weather that cropped up in the last couple of weeks. 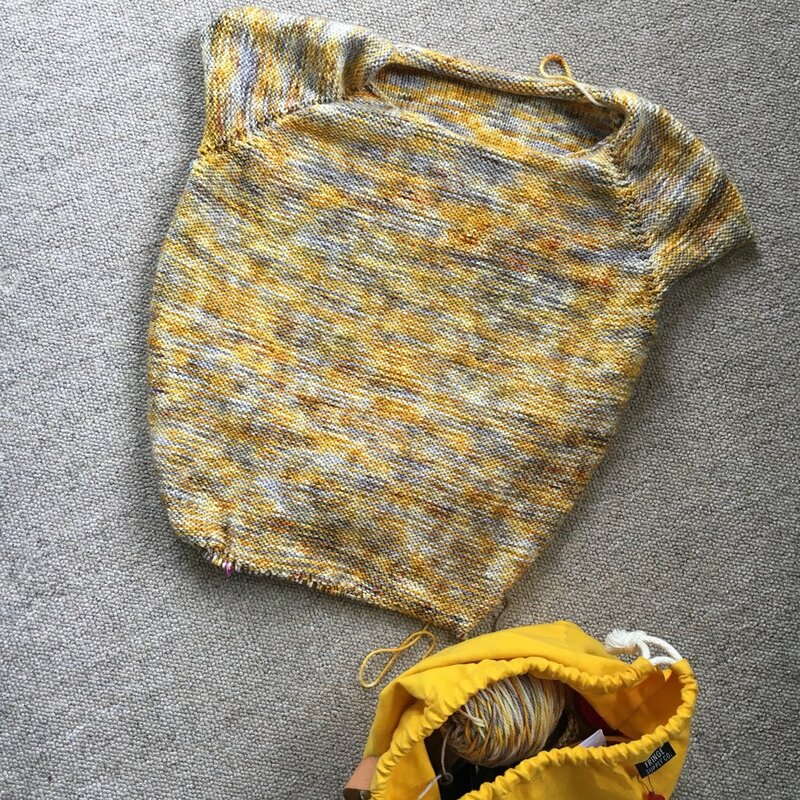 To celebrate the gorgeous May bank holiday weather, she’s woven up two handspun scarves over the weekend, but all that is now chopped liver as her new knitting machine has arrived and is operational, thanks to a detailed info dump from Alli! We’ve always been handknitters, but the ever expanding sizes of our stashes and reduced knitting time has led us to consider other options for trying to manage the yarn load! Alli was first down the machine knitting rabbit hole, and has dragged Rachel along with her. We talk about getting into machine knitting, how different it is, and the instant gratification factor! Rachel's ten-minute swatch - life will never be the same!